It had rained a great deal that whole week and yet as Saturday morning dawned there was not a cloud in the sky and the air was crystal clear. It was a beautiful, clear, amazing day. I got up early to do some errands and had my hair done up in curls. Are all brides beautiful? Later three of my friends and members came to pick me up and we drove out to the temple. It was in Cucamonga before it was Rancho Cucamonga. There was a steel factory and not much else. We would know we were getting close to our destination when we passed the Ontario Motor Speedway. The speedway is no more now turned into a super mall and when the put Rancho in front of Cucamonga, much of the landscape turned into million dollar houses. When I arrived at Myohoji Temple around 12 pm, the place was deserted. I proceeded to get ready and then I wondered if anyone would really show up. This was a hold back to Selma, and my low self esteem. Fortunately, I later found out that James was running a few minutes late since he and his Best Man Bruce Barnes had forgotten the rings! (The days before cell phones). Carol and Andrea came in to help. And one of my leaders, Suzanne. The wedding was at 1pm. My sister arrived with a new hairdo, the frizzy style and I thought to myself, it must be very windy out there? My leader, Suzan came to visit and I knew people were starting to come in. Finally it was time and the music played. More and more members, old friends from General Telephone, and relatives continued to arrive. It was a full house to my surprise. Bruce Barnes was James’ District Chief and his best man seen here walking the isle with my sister, Adrian, the maid of honor. Hi to John and Jason. Scott, Russ and Jerry.James’ Woman’s Chapter leader Cheryl Bell, Maryann and Ray, there is Bethany. Tom and Geraldine in the back. Many friends…..Nagila and Lauri….Jane and Ed. Ira and Bob and John. Mary and her husband are now Christians. Mary and I were in the same district in the beginning.There is Ford and Chuck in the back and one of my best friends, Linda. Ahh, then comes the happy Buddhist couple. When I walked out the sanctuary was filled with people~ standing room only. 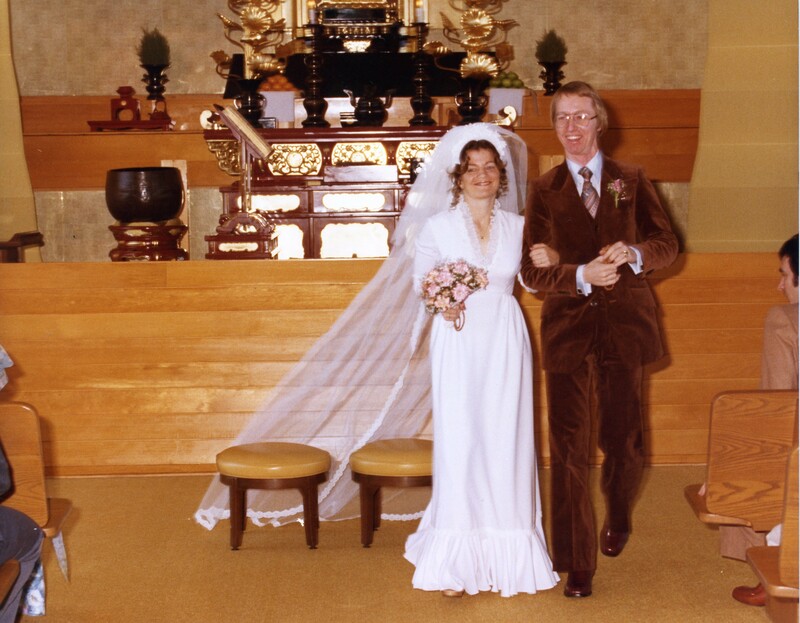 In the Buddhist tradition you are married already when you have walked down the isle. We then chanted through the sutra or the Buddhist prayers led by the Priest Reverend Sakata. We had decided that we would like to celebrate the traditional Japanese tea ceremony as part of our wedding vows, with one minor substitution that one uses sake, not tea. Traditionally, the tea is poured three times for each person and that person take three sips before returning it to the tea master, or in our case mistress, one of my friends from Japan. She is a master of the art and did an impeccable job. Very relaxing. Don shares a few words, followed by Rick. Out through the glass doors there was the sun shining and the green grass and the tremendous blue sky. Everyone should be married on such a day as this. I hardly remember chanting and doing the prayers, then the priest spoke about the woman being the pillars and the man being the roof. The priest performed the rites and then there was the kiss.Then the ceremony was over. “Let me now introduce to you, Mr. and Mrs. James Stephens. 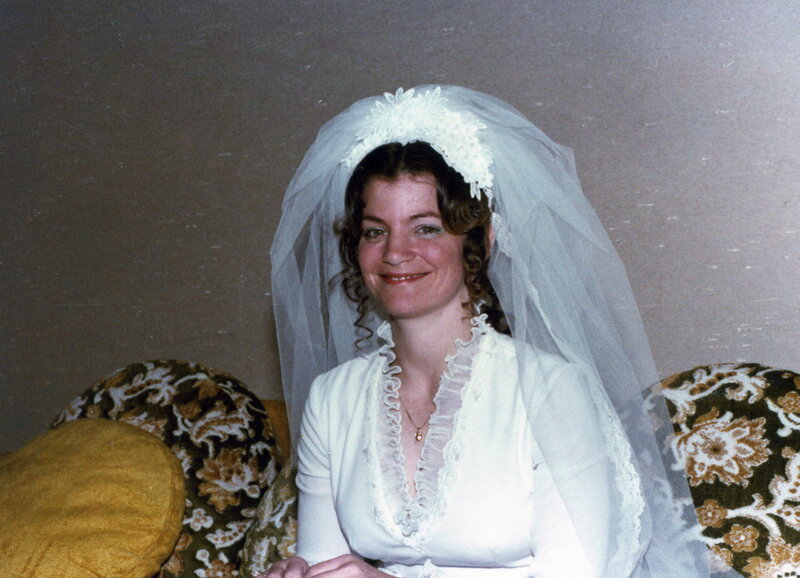 Posted on January 30, 2014 by James and Elizabeth Stephens •	This entry was posted in Elizabeth Stephens and tagged Adrian Lascar, Andrea Hairston, Bethany Coleman, Bob Rafkin, Bruce Barnes, Buddhist wedding, Carol McThomas, Cheryl Bell, Chuck Dekazarian, Ed Nakata, Ford Watson, General Telephone, Geraldine Battey, Ira Pelofsky, James and Elizabeth Stephens, James Stephens, Jane Pulver, Jason Kovatch, Jerry Wilhelm, Jim and Liz Stephens, John DeGomez, John Vigil, Lauri Sprague, Linda Schimoff, Mary and Jerry Imamori, Maryann and Ray Brasser, Myohoji Temple, Nagila Rhodes, Ontario Motor Speedway, Rancho Cucamonga, Reverend Sakata, Ric Coleman, Suzanne Harris, Tea Ceremony, Tom Gibbons. Bookmark the permalink. What a wonderful blog and story! Love the photos. Wish my blog had such a wonderful story. It was set up to keep a few people from Peace Press to follow what is going on with me because they want to help if possible. I don’t know if you would want to read it because it’s about stuff I don’t talk about on Facebook. You folks inspire me. I’m so happy y’all’s life is so blessed. Love you guys.